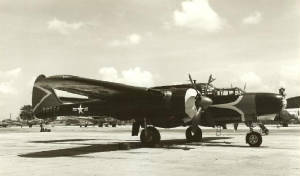 The P-61 was heavily involved in the Thunderstorm Project (1946–1949) that was a landmark program dedicated to gathering data on thunderstorm activity. The project was a cooperative undertaking on the part of four U.S. government agencies: the U.S. 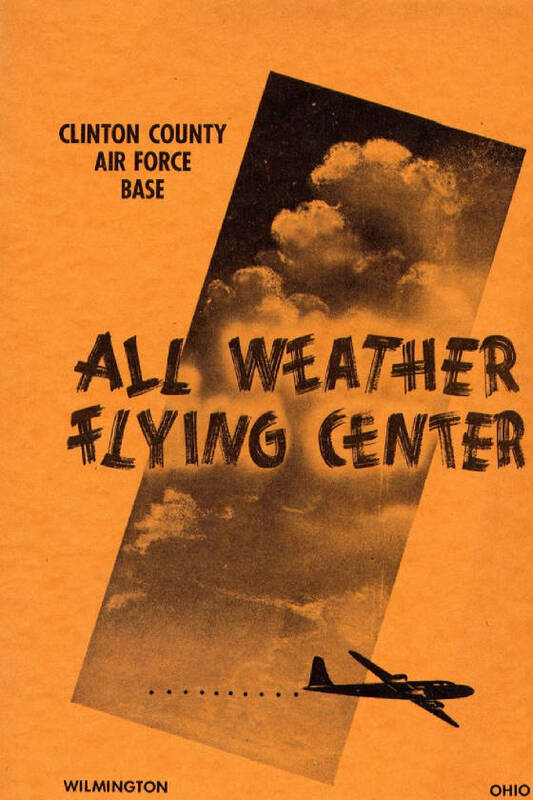 Weather Bureau and the NACA (National Advisory Committee for Aeronautics, later to become NASA), assisted by the U.S. Army Air Forces and Navy. Scientists from several universities also participated in the initiation, design and conduct of the project. The project's goal was to learn more about thunderstorms and to use this knowledge to better protect civil and military airplanes that operated in their vicinity. 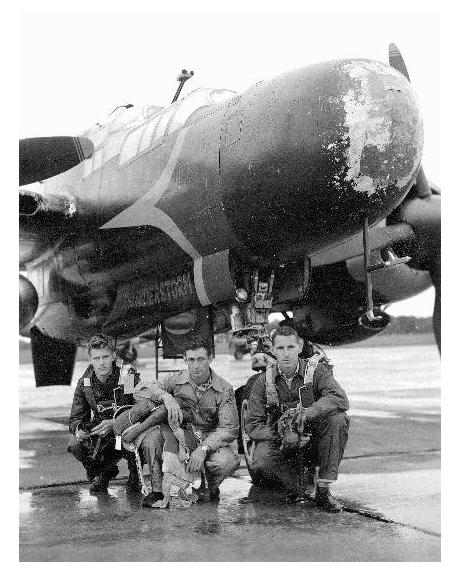 The P-61's radar and particular flight characteristics enabled it to find and penetrate the most turbulent regions of a storm, and return crew and instruments intact for detailed study. 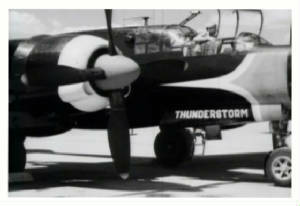 Multicoloured markings on an overall Black painted P-61C aircraft could have been applied only at the All Weather Flying Center at Clinton County AB in 1947, where the plane participated in chasing tornadoes as part of Operation Thunderstorm. This name was painted in Red on front undercarriage wheel well doors. The Weather Bureau during 1945 initiated a project for study of the development and structure of individual thunderstorm cells. Other agencies which will cooperate in this project are the Army Air Forces; the Navy; the Aircraft Loads Division of the National Advisory Committee for Aeronautics; Meteorology Department of the University of Chicago; Physics Department , University of New Mexico; Electronics Department, Massachusetts Institute of Technology; and the Soaring Society of America. The study, it now appears, will begin near Orlando, Florida. Observations and measurements in thunderstorms will be obtained over an area of about sixty square miles in the Orlando locality by means of airplane and glider flights, three radiosonde and several radar stations, and approximately fifty surface recording stations. The Army Air Forces will provide properly modified airplanes, with crews, for the thunderstorm project. The planes, to be in operation three out of every five days, will fly simultaneously in the thunderstorm at 5,000, 10,000, 15,000, 20,000, and 25,000 feet and will be carefully tracked and directed by means of radar and VHF radio. Five planes are to operate together in each thunderstorm mission. If possible, the planes will be of a type capable of carrying an observer, in addition to pilot and co-pilot. The Navy will investigate the possibility of using “drones,” radio-controlled planes directed either from the ground or from another plane, to carry recording equipment and to provide preliminary tests of thunderstorm flyability. The Navy will carry out a program fro the utilization of drones in the project, if tests indicate the feasibility of such a program. Balloons will be released in large numbers during thunderstorm conditions. These will consist of small balloons carrying conventional rawin targets for determining the horizontal circulation of various levels in the thunderstorm; radiosondes for obtaining the thermodynamic details of the thunderstorm; and radio transmitting balloons equipped for measuring turbulence, rate of climb and vertical air speed. All balloons will be tracked by radar. Special mobile radiosonde units will perform the balloon observations. Radar equipment will be used, not only for tracking airplanes and balloons, but also fro study of water content and extent of thunder clouds. The fifty ground stations, to be located in an area not exceeding twenty miles in diameter, will be self-recording station units consisting of microbarographs, wind vane – anemometer, hygrothermograph and recording rain gage. Research for the project will be carried on at the University of Chicago, the Naval Research Laboratory, operating through the Precipitation Static Project at Minneapolis, the University of New Mexico, Massachusetts Institute of Technology, and the Aircraft Loads Division of the National Advisory Committee for Aeronautics. The Soaring Society of American will work on the possibility of sailplane flight in thunderstorms. Overall coordination of research and coordination of work between various governmental and non-governmental participants in the project will be a responsibility of the Weather Bureau. The Bureau will also provide such personnel and equipment for the project as may be needed to supplement that furnished by the Army and the Navy. Mr. Lawrence M. Dye, Bureau Meteorologist, will spend the week of January 9 in Orlando to discuss the project with the Weather Office at the Army Airfield and to arrange with various property owners in the vicinity for establishment of ground stations on their lands. Down in Orlando, Florida, the Thunderstorm Project is well underway. Though its field headquarters are located in Orlando, the Project headquarters are in Chicago, Illinois, under Region Three. At the present time, there are 54 automatic recording surface stations, approximately one mile apart, south of Orlando in an area 7 miles wide by 13 miles long. All of these stations are serviced once daily with the double register, the rain gauge, microbarograph and hygrothermograph charts being changed every 24 hours. There are also six Army 658 raob-rawin stations located just outside of the area. This Army equipment is operated by Weather Bureau personnel. Communication between all of these upper air stations, headquarters in Orlando, and the controlling radar station located west of Orlando is carried on by means of the Project’s radio network. 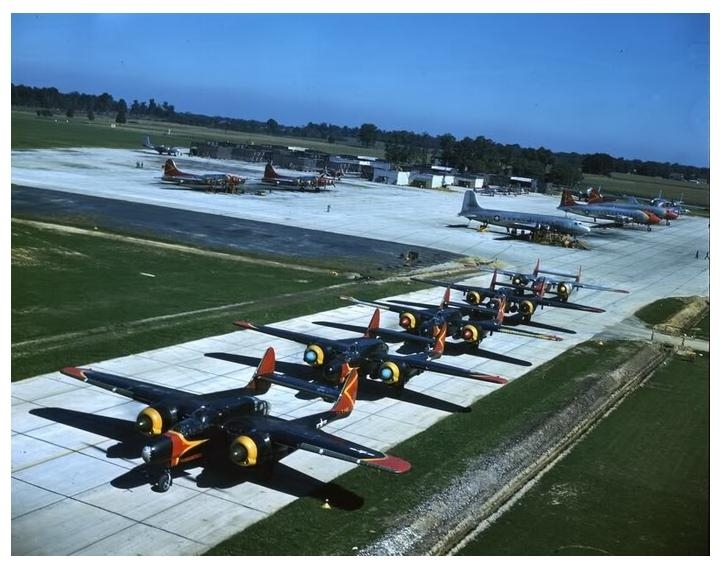 Along with the detailed microanalysis of the usual surface and upper air meteorological information, the project has nine P-61’s (the Black Widow) and three gliders assigned to it in order to get better information as to what takes place in a thunderstorm. These planes have instruments to record vertical currents, new electronic temperature measuring instruments, radio altimeters and radar scopes, which will be photographed, and it is hoped that the electrostatical field recorders will be received some time this summer. Surface maps are being plotted and drawn for every 5 minutes during the time of all thunderstorms or large convective showers. There were twenty such periods in May which is far above the climatological average. Some of the thunderstorms recorded so far have been small cloudbursts with up to five-tenths of an inch or rainfall recorded per five minute period. The total rainfall recorded for any one storm has been approximately 2 inches in one hour. Upper air analysis of raobs and rawins started on May 27 and the airplanes are scheduled to begin flying through storms the first part of June. Data received from all sources will be analyzed. Besides the field headquarters in Orlando, another sub-field headquarters has been organized at Station 26 in the surface network, on Lake Tohopekaligia where 3 temporary Army buildings have been erected. This serves as headquarters for the personnel that service the surface network, the personnel working on the 658 stations, and the personnel working on the 654 stations. Besides the 3 buildings, there is a 658 rawin and 1 of the mobile radiosonde stations located there. It is a well organized station, even to the nice beach for off-duty swimming a short distance down the road. This station is far from the nearest drinking water supply, and the need for a well was felt. The equipment for a pump type well consisted of pump, pipe, and a driving point. The latter caused Mr. L. M. Dye, meteorologist in charge of the Observations Section of the Project, some embarrassment. It seems that after driving the pipe and point approximately 8 feet into the ground, they decided to move the pump to a new location. The pipe came out, but not the driving point. At Mr. Dye’s suggestion, the men dug a small hole so that the point could be reached. However, this hole was quite narrow and the Meteorologist in charge of the Observations Section volunteered to be lowered by his ankles head first. This happened a bit more rapidly and violently than intended, and even though he did recover the pipe point, Mr. Dye had a hard time explaining to everyone just how he got that coating of sand during the middle of the day. Unlike any other group, the Thunderstorm Project people leave Florida to seek winter quarters. The operational portion of the Project folded its wings in Orlando September 20. 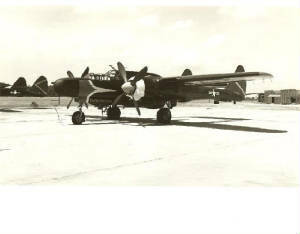 Special equipment mounted in Black Widow P-61 airplanes for this Project was removed during the week of September 23. The SCR-658 and SCR-584 units, as well as meteorological equipment used in the surface stations, will be dismantled during the two weeks following the closing of the project. Much data has been compiled during the operative season. From May 1 to September 20, rain fell over our network on 111 days. Ninety-one storms were chosen for detailed analysis. The SCR-658 stations (radiosonde-rawin) made 435 releases and the SCR-584 stations (radar-rawin) made 289 releases. 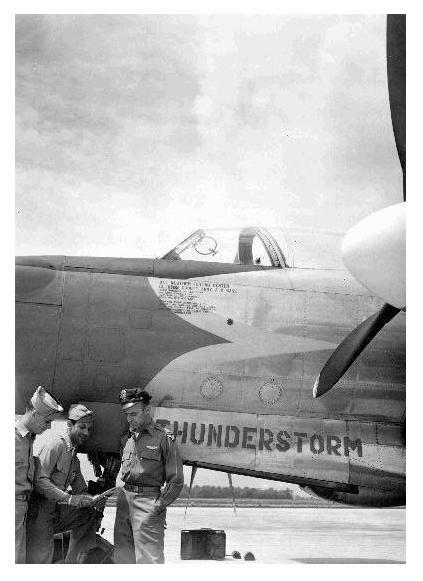 The P-61’s flew missions with a total of 554 traverses through thunderstorms, 17 through convective cumulus clouds and 11 on other assorted types of flights. The surface and upper air personnel had many interesting experiences during the summer. Manifold frogs, snakes and rats accidentally or deliberately found their way into automatic recording instruments. A frog, jumping up and down in a rain gage, gave a very queer trace. Radiosonde balloons encountered a number of unusual meteorological conditions. One balloon was tossed up and down between 14,000 and 17,000 feet for 32 minutes within a thunderstorm. Quite a few balloons were forced down due to heavy rain and icing conditions. During our airplane operations, one pilot reported heavy snow while flying a thunderstorm. Another plane was tossed over on its back twice during single traverse of a thunderstorm. Super-cooled water was encountered on numerous traverses. During the winter the Analysis Section will continue to work with the compiled data – both surface and upper air – with hopes of greatly increasing the knowledge of thunderstorms before next summer’s operations. This work will be done in the office of the Thunderstorm Project in Chicago, Illinois. Personnel who have collected surface data this summer are being transferred elsewhere within the United States – heading for all parts of the country until they are recalled to the Project next spring. Some of them will continue to make rawinsonde observations throughout the winter months at regular Weather Bureau upper air stations. Radar personnel, plus members of the SCR-584 stations are being organized to set up the Weather Bureau’s first Storm Detection Program. This Project is being organized in Washington. The second phase of the Thunderstorm Project will begin October 1. 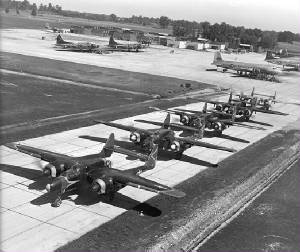 The Army portion of the Project is under the Air Material Command at Wright Field, with the operating area located in the vicinity of the Clinton County Airport, Wilmington, Ohio. During the winter months, the administrative force of the Thunderstorm Project will lay plans for next year’s operations. aircraft such as the Vultee XP-54, the goal being to give the pilot at least some slim chance of clearing the tail assembly and the propeller of the aircraft in the case of an emergency escape, but little progress had been made since pusher aircraft development had never really gotten past the drawing board or the initial prototype stage. 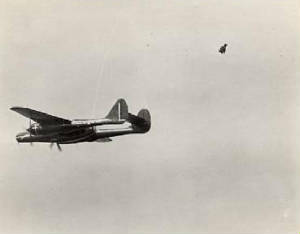 However, the development of high-speed jet-powered aircraft made the development of practical ejector seats mandatory. The Lockheed P-80 Shooting Star was the first operational jet fighter used by the United States Army Air Forces in August 1945. However, it was decided that the single-seat P-80 would not be suitable for these tests, and it was decided to switch to a three-seat Black Widow. 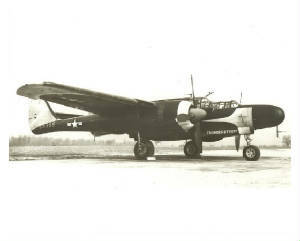 A P-61B-5-NO (serial number 42-39489) was modified for the tests, the ejector seat being fitted in the forward gunner's compartment. 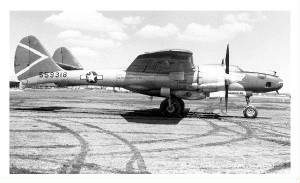 The aircraft was redesignated XP-61B for these tests (there having been no XP-61B prototype for the initial P-61B series). A dummy was used in the initial ejection tests, but on 17 April 1946, a volunteer, Sgt. Lawrence Lambert was successfully ejected from the P-61B at a speed of at . 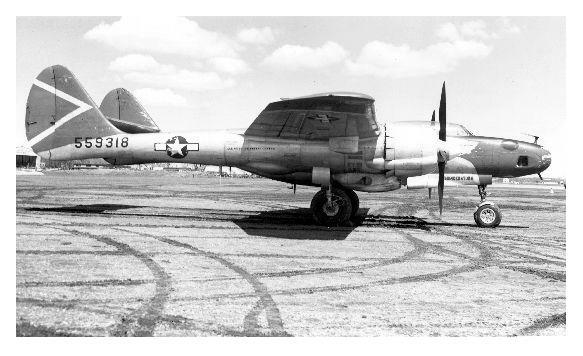 With the concept having been proven feasible, newer jet-powered aircraft were brought into the program, and the XP-61B was reconverted to standard P-61B configuration. 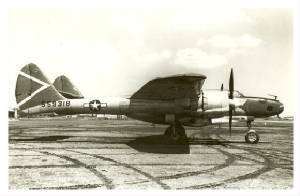 The aircraft above was redesignated XP-61B for these tests. A dummy was used in the initial ejection tests, but on 17 April 1946, a volunteer, Sgt. 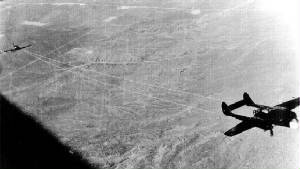 Lawrence Lambert ( above) was successfully ejected from the P-61B at a speed of 302 mph (486 km/h) at 7,800 feet (2,380 m). 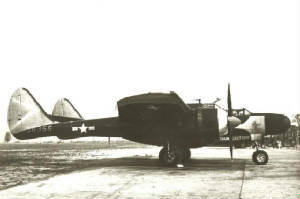 The Northrop P-61 Black Widow. It would be connected to the P-51 by means of two long tow cables having at the P-51 end a special release mechanism which Jimmy could operate if he got into trouble. The whole operation was a very tricky business. The towed takeoff, the climb to 28,000 feet, the release of the cables, and the descent to a dead-stick landing all added to the thrill of the experiment. But everything went off fine. The first flight was completed successfully and so was the second. On the third flight, however, difficulty arose. For some unexplained reason, the cable released from the Black Widow. It flew back and wrapped around the P-51 like spaghetti around a hot dog. Jimmy was in real trouble. Though trussed up like a Christmas turkey, he found he was still able to control the airplane. Gingerly he brought the P-51 down: in fact, he couldn't stop it from coming down as it had no propeller. He landed in a rather rough area, a quarry. The structure of the P-51 crumpled. When the dust had settled, there was Nissen crawling out of his wrecked plane, shaken but hopefully not seriously harmed. He was taken to the base hospital to be X-rayed for broken bones. Unfortunately, the X-ray machine was not working; Jimmy had clipped the powerline to the hospital on his way in for his ill-fated landing. The instrumentation fortunately survived the crash and provided the evidence that was sought. The flight data confirmed to an acceptable degree the results of the wind-tunnel tests. Although Ames engineers, as just noted, developed procedures for predicting the handling qualities of airplanes from wind-tunnel model tests, the prediction of performance factors, such as drag and speed, from such tests was quite a different problem. The test models were usually idealized with smoother, truer surfaces than the originals and lacked the gaps, excrescences, and rivet heads that were found in the actual airplanes. Moreover, there were other influences peculiar to the wind tunnel that were often difficult to evaluate. Such influences included the interference of the struts on which the models were mounted, the turbulence in the airstream, and the subtle effects of the surrounding walls. The rather indeterminate effects of these many factors placed in some question the accuracy with which the drag, and thus the speed, of an airplane could be determined from wind tunnel model tests. To obtain information on the subject just mentioned, Ames engineers undertook to make a comparison of the drag of airplanes as determined first by model tests in a wind tunnel and then by measurements made on the airplanes in actual flight. The comparison was made for only two airplanes, the P-51 and the P-80, but the results were expected to have general significance. The first airplane selected for the test was North American's new P-51 "Mustang" fighter, an airplane on which Ed Schmued, Ed Horkey, and  others of the NAA design group had lavished much attention. The P-51 was a good selection for the test. It was the first of a new class of extra clean fighter airplanes and the first to use the new laminar-flow wing sections developed by NACA. There was still a question of just how much laminar flow one could expect to get in an actual application of these sections considering the effects of propeller slipstream and all the unavoidable surface roughness resulting from conventional, or even refined, manufacturing methods There was also the question of whether the 16-foot tunnel, in which the model was to be tested, was sufficiently free of turbulence to allow the wings of the P-51 model to develop their full laminar-flow potential. These questions, however, merely added spice to the experiment. A one-third scale model of the P-51, without propeller, was carefully tested in the wind tunnel through a range of lift coefficients and speeds. This phase of the experiment was not unusually difficult. It was pretty much a conventional wind-tunnel test. The problem came in running the flight test-without a propeller. 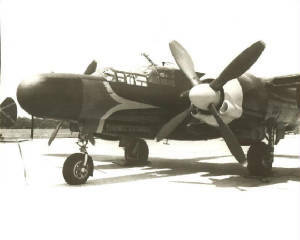 The propeller had been eliminated because there was no good way of measuring the thrust of either the propeller or the engine exhaust in flight, and these uncertain forces would totally obscure the drag of the airplane, the force which was to be measured. So the propeller was removed, the carburetor inlet blocked off, and the whole airplane polished and waxed to resemble the surface conditions of the model. The usual load of special NACA flight-research instrumentation had been installed in the airplane, and this included a sensitive accelerometer that would measure accelerations in the longitudinal direction with an accuracy of 0.01 g. The drag of the airplane would be measured by the deceleration it produced. With no propeller, the P-51 would have to be towed to altitude and there released to descend along some prescribed path to a dead-stick landing. 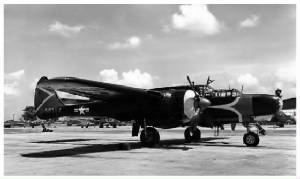 The NACA pilot, James M. (Jimmy) Nissen, recognized the hazards involved. True, he did not expect to get any special financial reward for undertaking work involving unusual danger-NACA pilots never did-but if he felt any concern over these dangers, it was buried in his great enthusiasm for the project. In any case, the flights were to be made from the Army base at Rogers-more commonly called Muroc-Dry Lake where the maximum opportunity for a safe landing would be provided. 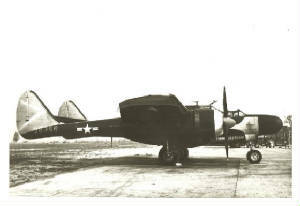 The airplane chosen to do the tow job was the Northrop P-61 Black Widow. It would be connected to the P-51 by means of two long tow cables having at the P-51 end a special release mechanism which Jimmy could operate if he got into trouble. A description of the whole project is given in TR 916 (ref. A-6) authored by James Nissen, Burnett Gadeberg, and William Hamilton. A foreword was added to the report by NACA Chairman Jerome Hunsaker in recognition of the special contribution made by Nissen. The hazards to which NACA test pilots were subjected were considered acceptable only if they could not by any reasonable means be avoided. In this case, the whole project had been rushed and a question remained whether' with a little more deliberation, a little more care and checking, the failure of the cable attachment could have been avoided. The lesson learned was reasonably cheap, but it could have been otherwise. 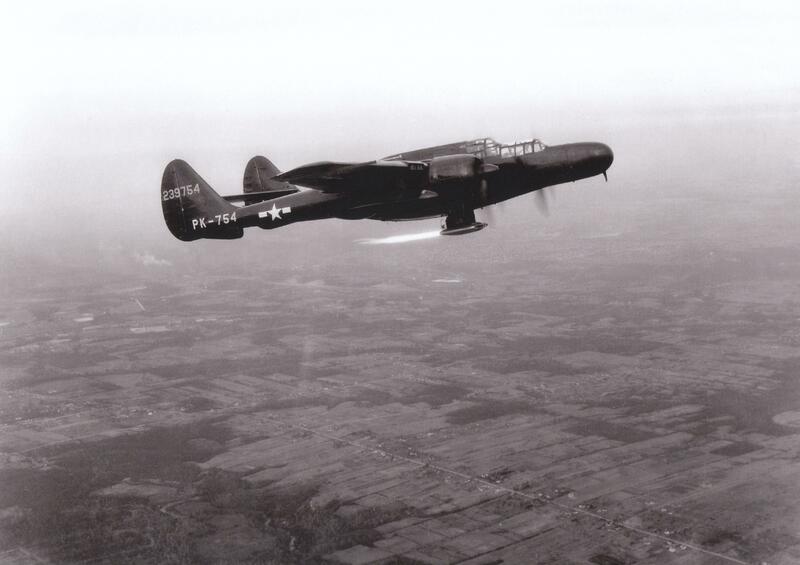 The P-61 Black Widow was used to test a number of American ramjet powered missiles and engines. 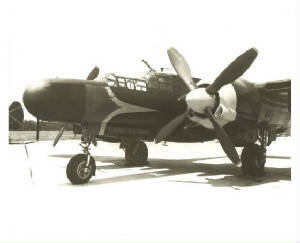 The Navy borrowed two P-61Cs (43-8336 and 43-8347) from the USAAF and used them for air-launches of the experimental Martin PTV-N-2U Gorgon IV ramjet-powered missile. 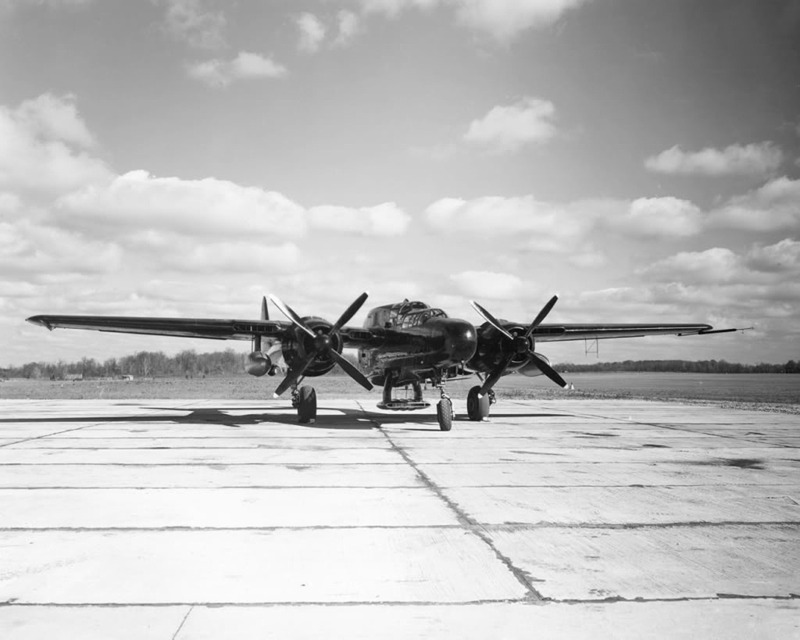 A P-61B (42-39754) was used by NACA's Lewis Flight Propulsion Laboratory in Cleveland, Ohio for tests of airfoil-type ramjets in 1947. 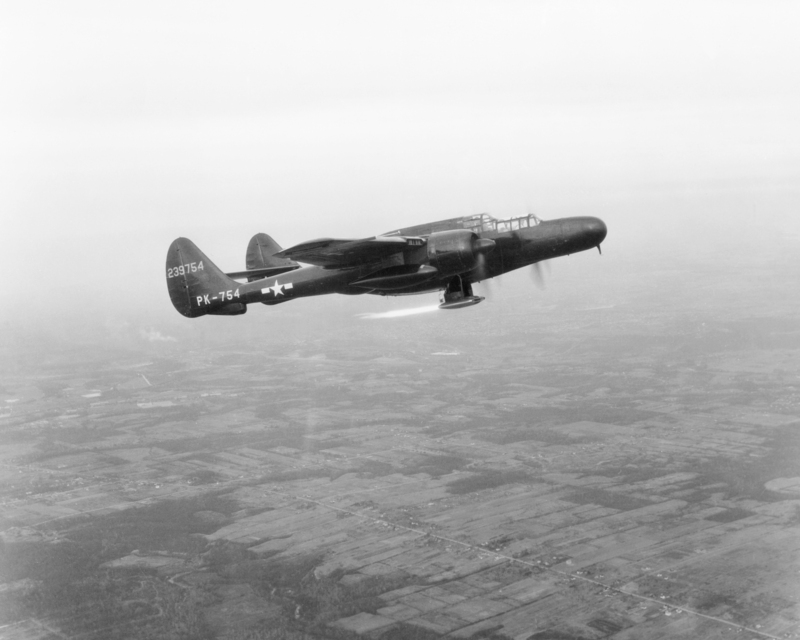 Shortly after the war, the Navy borrowed two P-61Cs (43-8336 and 43-8347) from the USAAF and used them for air-launches of the experimental Martin PTV-N-2U Gorgon IV ramjet-powered missile, the first launch taking place on 14 November 1947. 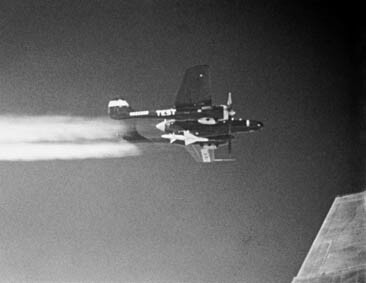 While carrying a Gorgon under each wing, the P-61C would go into a slight dive during launch to reach the speed necessary for the ramjet to start. 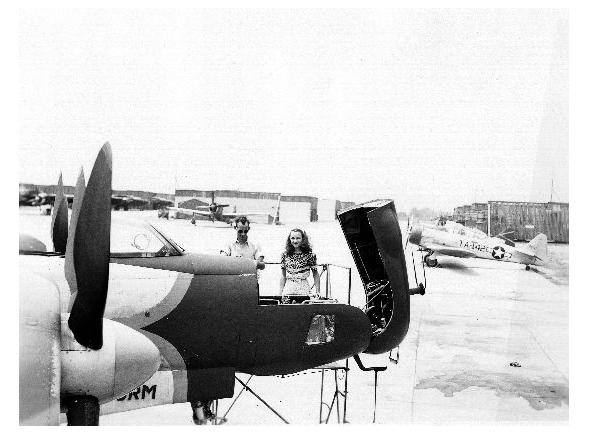 These two naval Black Widows were returned to the USAF in 1948, and transferred to the bone yard shortly afterwards. The subsonic, ramjet-powered, air-launched Gorgon IV was developed in 1946 as an air-to-surface missile. The Glenn L. Martin Company modified several Gorgon IV models for use as target drones, however, for launch from standard Mk 51 bomb racks under a P-61 aircraft. The Gorgon IV was considered the U.S.'s first successful ramjet missile, although it never became operational. Twelve test flights of the Gorgon IV were made at the Naval Air Missile Test Center, Point Mugu, California. The tests went well and by late 1948 the Navy began fitting the USS Norton Sound for trials for launching the missile the deck, but the project was cancelled in 1949. The missile shown here appears to have been flown and recovered. It was donated to the Smithsonian in 1966 by the U.S. Navy. Interest in the transonic flight regime increased markedly after the Second World War, reflecting further attempts to increase aircraft performance. However, wind tunnels of the time were inadequate for carrying out this kind of research. 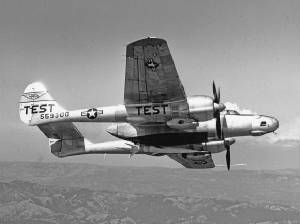 For a time, tests were conducted in flight with small airfoil and aircraft models. These models were attached to the wings of conventional fighter aircraft, in some cases on a raised surface known as a "transonic bump," where the airflow would be compressed and accelerated to transonic speeds during dives (hence the term "wing-flow" testing). Larry Clousing performed the first of these tests in the P-51B. In experiments with a thin, straight wing with a symmetrical double-wedge profile, lift data matched theoretical and wind tunnel predictions up to Mach 0.82. For Mach numbers through the transonic range up to 1.2, trends in lift disagreed with theory. Pitching moment data indicated aerodynamic center movement approached the theoretical predictions for subsonic and supersonic flow. In another series of tests, the control effectiveness for several flat-plate delta-wing planforms with trailing-edge flaps was explored. Pitching moments were measured for various flap angles over a speed range up to Mach 1.1. Data showed a reasonable trend through the transonic range. In another approach to acquiring transonic aerodynamic data, heavily weighted models of the configuration of interest were dropped from high altitudes. In those tests, which were conducted at Edwards Air Force Base, aerodynamic bodies that were to be evaluated in the transonic flight regime were released from an aircraft at altitudes up to 43,000 feet. The instrumented bodies would pass through the transonic speed range in free fall, during which they were oscillated through a range of angles of attack and were then decelerated and recovered by means of air brakes and parachutes. Testing at these altitudes was arduous and, although the pilots wore heavy flight suits, the model drops were made on the first run to reduce the pilots' exposure to the extreme cold. 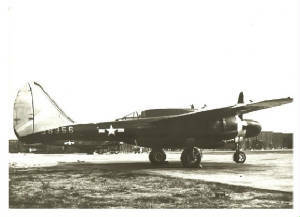 The F-15A-1-NO aircraft, a reconnaissance model of the P-61 night fighter, was used for these tests. The high-altitude capability of the F-15A made it the ideal "mother ship" for this work. An aircraft similar to this one, an ERF-61C, owned by the Smithsonian Institution, was lent to Ames to be used in this program as well. Pilots who participated in this work were George Cooper, Rudolph (Rudy) Van Dyke, Don Heinle, and Fred Drinkwater. As with the wing-flow tests, qualitative results were obtained; nevertheless, the advent of the new transonic tunnels supplanted flight testing as a means of documenting the aerodynamics of this flight regime. The air-brake and parachute systems developed for these tests were subsequently used by many agencies for rocket and satellite payload recovery. The next step in developing transonic test methods came in 1946, when Lockheed and NACA engineers simultaneously observed that the wing-flow method could be applied to wind-tunnel testing by installing a bump, simulating the wing, on the floor of a high-subsonic-speed wind tunnel. At times the bump technique was applied in the 16-foot tunnel while the wing-flow method was used in flight. In 1946 the Flight Engineering Section at Ames foresaw the end of the deicing work and proposed a continuing program of research in the general field of aircraft operating problems. This proposal was turned down by NACA management. Then along in 1947 Harry Goett, who was in general command of the flight engineering activity, suggested to NACA Headquarters that Ames set up a pilotless-aircraft test operation similar to the one being established by Langley at Wallops. Dr. Dryden was opposed to having Ames duplicate Langley's efforts in developing rocket-launching and telemetry techniques, but he did not object when Harry proposed the dropping of recoverable models from a high-flying airplane. Thus as the icing work began to phase out in 1947, Ames developed the technique for recovering intact, by means of air brake and parachute, instrumented test models dropped at high altitudes from an airplane. In this way aerodynamically clean models, if dropped from a sufficiently high altitude, would traverse the transonic range and, indeed, reach low supersonic speeds before they had to be braked for a landing. 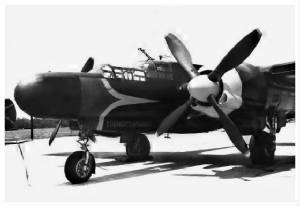 The airplanes chosen by Ames engineers for the drop operation were a group of three Northrop P-61 "Black Widow" night fighters of which one, intended for photoreconnaissance uses, had been equipped with a turbosupercharger. 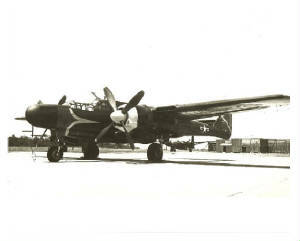 Another one, owing to the relative scarcity of P-61 airplanes, had been borrowed, for cannibalization purposes, from the museum of the Smithsonian Institution. 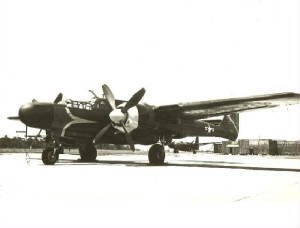 In the drop operation, the supercharged P-61 was flown to altitudes up to 42,000 feet. As it did not have a pressure cabin, the physical stamina of the pilots was sorely taxed. But useful data were obtained and the development of the recovery technique, a notable accomplishment in itself, was helpful to other agencies later in attempts to recover expended missiles. The greatest contributors to the development and use of the drop technique at Ames were Alun Jones, James Selna, Bonne Look and Loren Bright. 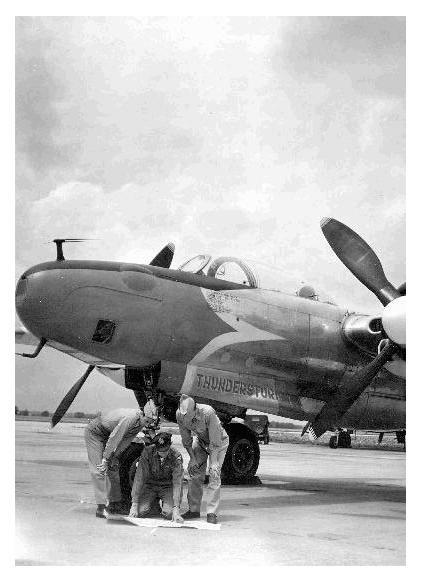 Among the pilots who flew the P-61 for the drop tests were George Cooper, Rudolph Van Dyke, and Robert Whempner of Ames and Joseph Walker of the NACA High Speed Flight Station at Edwards, California. 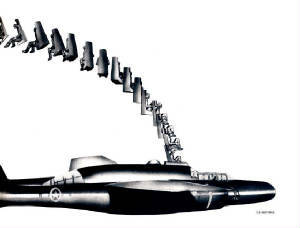 In 1941 the NACA started work on the possiblties of developing a Ramjet engine. The idea came from work on the "Meredith effect." In the USA, they were however unaware of the work of Lorin and later work by Carter, V Leduc and Schmitdt. 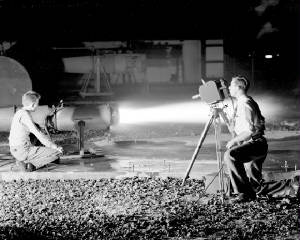 The tests were carried out in the February and March of 1941 finding out that the idea of a "Ramjet"was possible. By the end of 1945 the NACA had a number of Ramjet projects "on the go" at both of it's Langley and the Lewis Laboratories concentrating on combustion and burner design. The result was the I-40 Ramjet which descended from British Whittle W.2B. 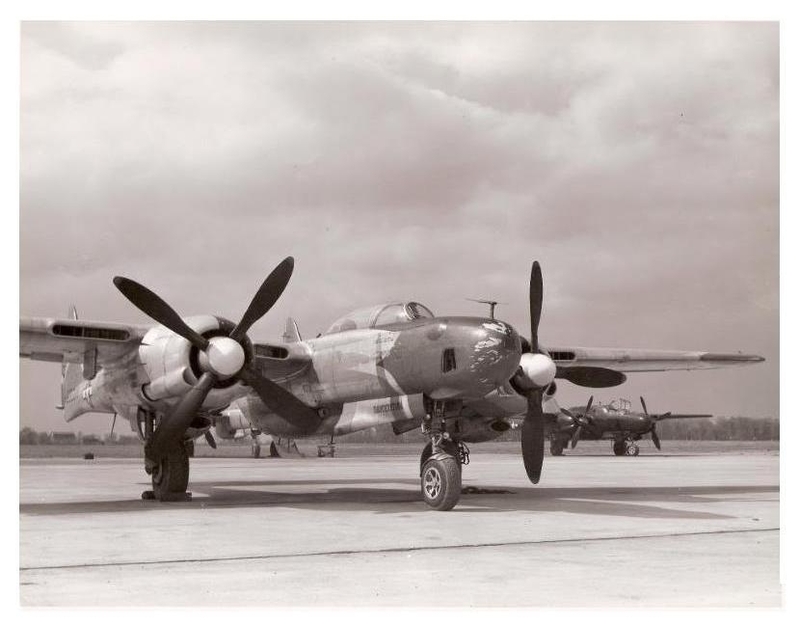 The P-61 aircraft was used by the Aircraft Engine Research Laboratory or AERL of the NACA to test the new two dimentional Ramjet engine. The AERL is now NASA's John H. Glenn Research Center in Cleveland, Ohio.